Today, exactly three weeks after losing her, I will be picking up my sweet Rosie's cremated remains from the emergency vet where we took her on her last day. They also used her adorable little feet to make some clay paws for me. And I also requested some of her fur, some of all three of her beautiful colors. This will all be coming home with me today, to my new house, so that my baby girl Rosie can be there with me even more so than she already is now. I'd be lying if I said that this all wasn't bringing tears back to my eyes, as it's chipping away at the scab that's started to heal over for me. But I will be glad to have my beloved angel Rosie's remains safe and sound with me, and I will always and forever cherish them alongside my wonderful memories of her. Yesterday, for Memorial Day, my parents came over to my house for a visit. It was great to see them, but what's more, they brought Trapper and Talon to visit as well! Upon moving to my new house I wanted to make sure that all of the animals still got to see each other routinely. With Astrid this is easy, because she thinks she owns both my house and my parents' house, and so she goes back and forth between the two more than willingly. Furbaby reunions are also made relatively easy due to the fact that both Trapper and Talon do great in a carrier and when going new places, and so my parents can bring them to my house without any stress or fuss. Thimble, Evan, and Toby, on the other hand, are fairly certain that pet carriers are the root of all evil. I still take them to my parents' on occasion, though, in hopes that their fear of the carrier might be reduced by knowing that it can also mean a nice visit with family and not just a trip to the vet. So far no luck with that, even with my leaving the carrier out 24/7 in hopes that they will start seeing it as a harmless entity. Getting back on track, though, yesterday was a beautiful day with everyone all together under one roof again. We humans had a delicious cookout, while the animals had a great time playing together! 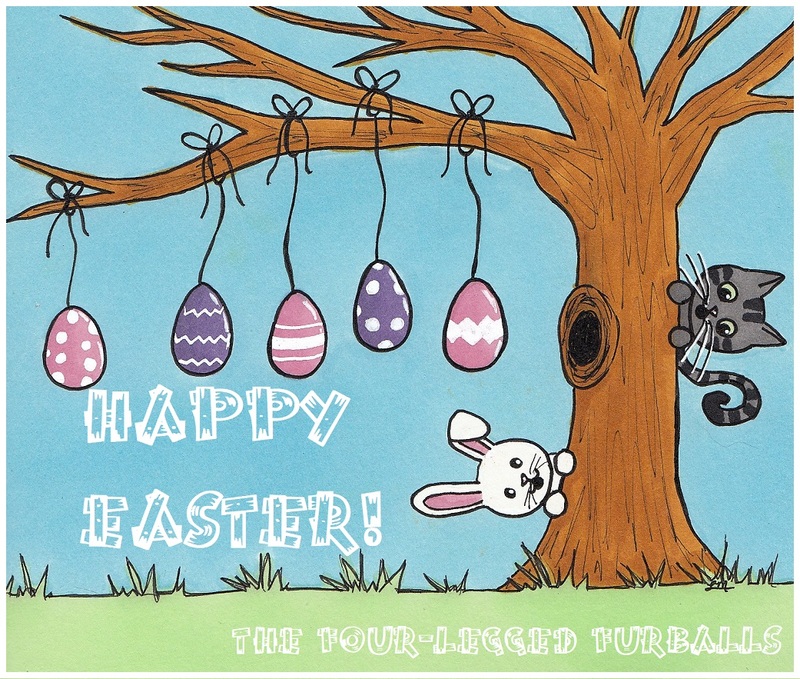 By the time suppertime rolled around, all of the furbabies were tuckered out and ready to nap. Evan loves to redecorate for Mommy, especially when it comes to rugs. This particular rug is obviously more comfortable with one corner flipped up. Toby and Talon got their cuddles on next to a window on this bright and shiny Memorial Day. And my baby girl Thimble played and played and played with her brothers, and then zonked out on Mommy's bed. Yesterday was a beautiful day to be with family and celebrate the brave men and women who have served our USA. I hope you all had as blessed of a Memorial Day as my furbabies and I did! It's Thimble's turn in the kitty bed. My furbabies and I want to thank all the brave men and women who have served! Happy Memorial Day! My last post gave you a glimpse of how Thimble is settling into my new house, as well as into her new role as her mommy's only feline furbaby girl. As you saw, Thimble is doing great, especially with what I like to consider some divine intervention from my sweet angel Rosie. Now, how are my other furbabies handling the move? Evan is also doing great. At least now he is. Both he and Thimble hid under my bed for the first day or so, with Evan hiding longer and more often than Thimble. While Thimble was a brave girl and started exploring (very cautiously) the house on her first night there, Evan stuck exclusively to my room for a full two or three days. He would come out from the under the bed if I was in my room to offer cuddles, but as soon as I left the room he would go right back under the bed. Now, though, except when going under there for an occasional nap, Evan ignores the space beneath my bed. He loves to explore and play throughout the house now. Although, like Thimble, Evan especially loves bedtime and sleeping on Mommy's bed. "Why, yes, I am king of this bed. You may now bow down." Although he is not as consistent as Rosie was or as Thimble is about bedtime cuddles, Evan does love to visit me throughout the night for occasional snuggles. (And sometimes, like this morning, he likes to wake Mommy up by sliding over her pillows and her face.) One of his favorites spots on the bed is at my feet, much like Rosie did and Thimbles sometimes does now. His other favorite bedtime sleepy spot is in the new pet bed that I got for him and Thimble, which I always put next to me on my bed at night. Evan and Thimble both love this bed, but Evan usually wins out and gets to keep it. "I am also king of this stool. You may now bow down, again." As I said before, Evan is very strong. He easily pulls himself onto this stool, and then onto my bed. As is the case with the one you see above, I make sure that all stools that Evan uses have a soft, cloth surface on top. Otherwise, an abrasive surface (such as bare wood) would create or exacerbate existing soars that Evan sometimes gets on his back legs from dragging them behind him. Whoa! Photobombed by a yawn. And now, of course, we can't forget the only canine furbaby - Astrid! Astrid has loved the new house from the get-go. She was the first furbaby to visit my new home, and she immediately considered it hers. She explored and sniffed every corner. And now that she's been living there, when we take her anywhere else, even to see her beloved pawpaw and gammy (my dad and mom), she makes it known when she's ready to go back to her house. One of Astrid's favorite things (which is also one of my favorite things) about the new house is that it has plenty of big windows, from which Astrid loves to keep a watchful eye on neighbors and wildlife. Also, something that all the furbabies love, is that this is their first house with doors that allow a view even from all the way down on the floor. The front entrance has a sturdy glass screen door from top to bottom, and the back door is paned from the top to the bottom as well. Astrid loves this, but so do the kitties (especially Evan, who otherwise has trouble getting to and seeing out of windows). So many windows, so little time! Astrid has also gotten into a pretty good routine, and she loves her evening naps during TV time. "Seriously, Mom, enough with the paparazzi." So we're all settling in. It's still taking some getting used to, but all it takes is time. It's a bit of a strange, often melancholic, and at times bittersweet time of transition for me and my furbabies. Today is two weeks to the day since I lost my sweet old girl, and I am still forcing myself to learn to live with a routine that does not include cuddling, feeding, medicating, and overall looking after my precious Rosie. 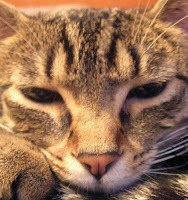 At the same time, I have moved into my new house, along with my other furbabies – Astrid, Evan, and Thimble. My sister (Astrid's co-parent, also known as her "Other Mommy") also lives with me at my new house, which means we are also graced with Toby's presence. I'll also note that I moved to a home close to my parents', and so I still get to bestow cuddles upon Trapper and Talon practically on a daily basis. In this time of transition, I still miss my Rosie each and every day. However, I often feel better after stopping to have even just a quick little chat with her up in her new headquarters. I send her my love, and then I feel better about going about my day. Although I of course wish there were a way that I could have her by my side again, that is not meant to be right now. She is now enjoying her youth and health again, and I know she is watching over me. This will always be one of my favorite pictures of my precious Rosie. It perfectly portrays her sweet, loving face, as well as her beautiful markings. Thank you again to Ann from Zoolatry for this beautiful remembrance badge for my Rosie. It is so greatly appreciated and will be treasured always. Rosie will never be replaced. There is no cat in the world who could ever even begin to take her place, neither in my home nor in my heart. And I know that can be said of all beloved furbabies. Yet, although neither Rosie nor any furbaby can be replaced, I'm learning that our angel furbabies can certainly leave behind others who seem capable of following in their footsteps. For me, this little footstep-follower is my little girl Thimble. I'll backtrack and begin by saying that Rosie and Thimble never got along. Rosie did not like the company of other cats, and she would quite literally slap some sense into them if they even considered coming into her space. After but one or two brief run-ins with the old queen of the house, Thimble was absolutely petrified of Rosie. Needless to say, the two little ladies never spent time together. For that reason, although I might have hoped it, I never expected Thimble to pick up any of Rosie’s habits or follow her lead once my sweet Rosie was gone. Boy, was I wrong. Somehow, as if Rosie gave Thimble private lessons when this mommy's back was turned, Thimble has started to emulate Rosie in many ways. One main way she does this is in my bed at night. Before moving to the new house, Thimble had never slept in my bed with me at night, because that was Rosie’s rightful place. I knew I was going to greatly miss all of my nighttime cuddles with Rosie, and I only hoped that one of my other furbabies would continue her tradition. That being said, since her very first night of having access to my bed, Thimble has not only insisted on spending the night snuggling with me, but she has taken up almost all of the usual places where Rosie used to sleep. Even in a different bed, one of a larger size for that matter, Thimble sticks close to me and in nearly the exact same spots as Rosie did. This includes Thimble often starting out the night nestled between my feet, with me in my assumed spread eagle position that Rosie also always insisted of me. And later in the night, just like Rosie used to do, Thimble will work her way up to my side – she always selects my right side, just like Rosie always did – and spends the remainder of the night cuddling me there. I feel like this is Rosie looking down on us, telling Thimble how things are meant to be. Even Thimble's play resembles Rosie's. It always did slightly, but she reminds me of Rosie even more now than before. As a youngster Rosie was always a batter and swatter, slapping toys around and knocking things off of tables. Thimble does the exact same thing. I call her my little hockey player, as she'll bat around just about anything, although she does have her favorites – she certainly prefers playing with a wadded up paper or other similar piece of trash rather than a cat toy. "It's not one of my favorite pieces of trash, but I guess Mommy's camera wrist strap will do just fine to swat at." Thank you, Thimble, for helping Mommy through this. Rosie is missed immensely, and she can never be replaced. But it certainly helps to know that she is looking down on me, and that she seems to have sent some tips Thimble's way on how to be this mommy's proper little ladycat. Whether up in heaven or here on earth, they will always be my beloved feline baby girls. Cats leave paw prints on our hearts. I think I'm ready to begin blogging again. Although I have not posted anything for over a week, please know that I read each and every comment you wonderful bloggers left me after the passing of my beautiful, precious Rosie. Thank you all so much. Your words and your kindness have truly helped me through this difficult time, and it brings me a great deal of comfort and inspiration to know that my Rosie was not only dear to me, but that she also touched the hearts of so many others. Of course, I still miss my sweet old girl more than words could ever describe, and I talk to her and tell her how much I love her every day. It helps me to have these little conversations with her, and I also wholly believe I owe her this, as Rosie is and always will be a prominent influence on who I am today. I'm going to age myself by divulging that my family acquired Rosie as an 8-week-old kitten when I was just 4 years old. I grew up with her, and then entered into adulthood with her by my side. She was my consoling cuddler after tough days at school as a child, and then later after long days at work as an adult. She was there for me through everything. Rosie largely shaped me into the animal-loving adult I am today, and she has always been and will always be my loyal companion. So, after 21 and a half long, wonderful years together, I now miss my Rosie very, very much. But, I have come to a comforting peace of mind knowing that she is now free of all pain and discomfort and is watching over me. On another note, one thing that has made this difficult time even more surreal for me is that I have, for some time now, been in the process of moving. I had mentioned the purchase of my first home in earlier posts, before Rosie fell ill. I believe I had mentioned that, as I was nursing Rosie, I put my move on hold. 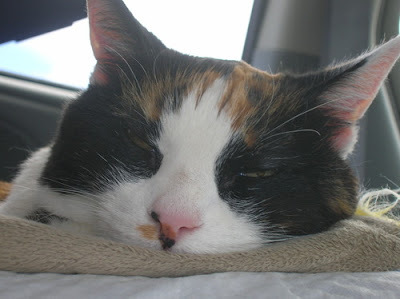 I did not want an ailing Rosie to be stressed by being moved away from her home of 21 years. That being said, when it was believed that Rosie was simply suffering from a bout of pancreatitis and we thought we could nurse her out of it, I had every intention of and was already making plans for moving her to my new house. My parents had let me take a nice, comfy chair that Rosie often rested on at their house, so that she would have something familiar at her new home on which to sleep and eat. The chair had already been placed in the corner of my bedroom directly beside my bed at my new house. After Rosie passed, when I went into my bedroom at my new house and saw her chair, I felt at a complete loss. I was completely torn as to whether or not to keep my room set up that way. That was Rosie's chair, and my room had been set up so that she would be the only animal allowed within, since she preferred to be left alone by the dog and the other feline furbabies. On one hand, I had already ultimately decided that, with Rosie gone, I would go ahead and allow my other furbabies into my room at my new house (they had never before been allowed to sleep with me at night, because at night my bed was, more accurately, Rosie's bed). However, I had not yet decided whether I wanted the chair to stay. My primary holdup was that it had always been Rosie's chair, and I was hesitant to allow any other furbabies to use it. Ultimately, I decided to remove the chair. I simply felt compelled to have the chair remain Rosie's and Rosie's only. It was placed back at my parents' house, in the exact same spot where Rosie used it to sleep and sunbathe. However, I certainly could not bring myself to remove all memory of Rosie from my room at the new house. Rosie had always been my roommate, so to speak, and I decided I wanted some sort of memorial in my new bedroom in honor of my sweet, loyal Rosie. I placed this shelf in the exact same corner where Rosie's chair had been set up for her. Although, sadly, she never did get to use it, it will always be Rosie's corner. A rose and artwork, in honor of my sweet Rosie. As it says, cats truly do leave paw prints on our hearts. Whether or not it was something along the lines of foresight, I had actually started this art piece days before Rosie took a turn for the worse on that dreadful Thursday when we had to say our goodbyes. After Rosie passed, I felt obligated to finish this piece in her honor as soon as possible. I fine-tooth combed through countless pictures of Rosie (during which I felt both sadness at her passing but also such gratitude for all of those memories with her), in order to ensure that I got her markings as close to perfect as possible on my drawing of her. 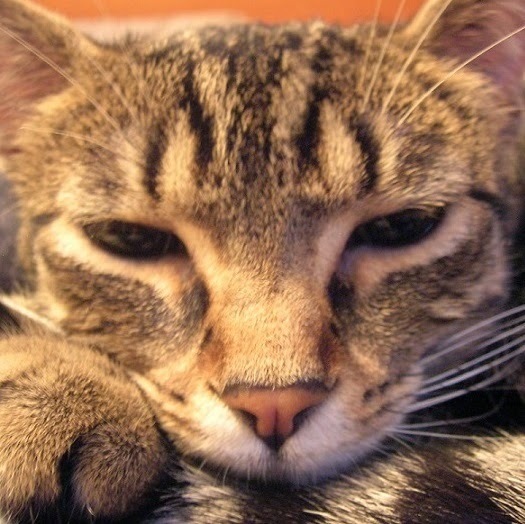 As a sort of connection between us, I chose purple and pink as the color scheme -- purple is my favorite color, and I always loved the adorable pink color of my princess Rosie's paw pads and nose. And there is also, of course, a story behind the ribbon attached at the art piece's top. In my room where I used to live at my parents' house, I had a headboard upon which I once years ago randomly placed a pile of ribbons. Rosie soon after found these ribbons and began to play with them. From that day on I kept them there, and she would occasionally wake me up at night and look up at the ribbons until I gave her one to play with. The ribbon I attached to the artwork I made for her is one of those very ribbons with which she and I played together so many times, including once not much more than two or three weeks before she passed. Thank you all again for your kind words and thoughts for both Rosie and myself. I appreciate it so much, and I know my Rosie does too. Cats leave paw prints on our hearts. Rosie's will remain on mine forever. I wanted to stop in to thank all of you for the outpouring of thoughtful kindness after the loss of my precious baby girl Rosie. I miss my sweet old girl so very very much, more than I could ever describe in words, just as I will always love her more than I could ever put into words. Yet I am also more than grateful for the time I was given with her, and grateful that she is now free to be young and in perfect health again. I look forward to the day when I get to be with her again. I will indeed love you forever, my sweet baby Rosie. Rest in peace, my sweet Rosie. This post pains me to write. After a sudden, harrowing onset of severe lethargy and rapid, open-mouthed breathing this morning, Rosie was rushed to the emergency clinic at the local university, where imaging revealed congestive heart failure alongside advanced signs of probable cancer of the pancreas, spleen, liver, and intestines. 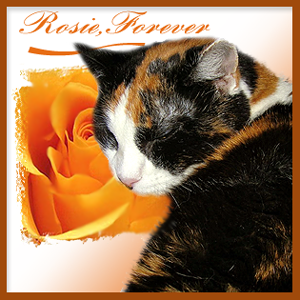 I made the difficult decision to help Rosie cross the Rainbow Bridge. I stayed by her side until the very end, making sure that she knew just how precious she has always been and always will be to me and my entire family. I love and miss my sweet, tough old gal more than words could ever describe, but I am grateful that she is now free of all pain and ailments. My sweet Rosie, you are and will be loved forever and always. Thank you for 21 wonderful, loving years by my side. You will always be my beautiful, sweeter than sugar, one tough cookie of a girl. Rest in peace, my precious baby girl. Thank you for all of your purrs, prayers, and support. They have meant so much to me and my sweet Rosie. Please excuse me if I am absent from this blog for a period of time as I grieve yet also celebrate the life of my precious baby girl Rosie. My last post was last Thursday, after I had given Rosie mirtazapine (appetite stimulant). I mentioned to you how she seemed a strange mixture of agitated and drowsy on it. Well, those side effects didn't stop there, and that night she seemed wobbly, had a noticeably increased respiration rate, and ended up urinating on my bed (with me beneath the sheets) rather than making the trip to her litter box. That certainly surprised me. I called the vet first thing the next morning and dropped Rosie off for a recheck, and for them to monitor her side effects of the mirtazapine. Upon arriving at the vet Rosie was weighed. She was down to 8.5 lbs, after having been 9.25 just a little over a week earlier. Although I've been syringe feeding her when she refuses to eat on her own, neither Rosie nor I have been able to give her the nutrition she was previously getting. As for the rest of her vet visit last Friday, after the vet looked at her she called me and indicated that just as Rosie tends to be somewhat sensitive to a number of pain meds (such as butorphanol), she is also obviously sensitive to drugs like mirtazapine. However, even though Rosie's heart rate and respiration rate were slightly elevated, the vet advised me that Rosie was overall managing the drug and its side effects pretty well and would be fine. That was a relief. At that time the vet also prescribed Rosie Cerenia (anti-nausea/anti-vomiting medication), as even though Rosie had not been vomiting, her persistent smacking and drooling whenever sniffing or attempting to eat food were classic signs of nausea. 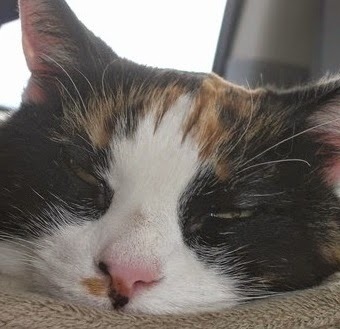 Whereas the vet had previously told me to try giving Rosie subcutaneous fluids twice a day in order to combat her persistent dehydration, she now told me to back off to once a day again. 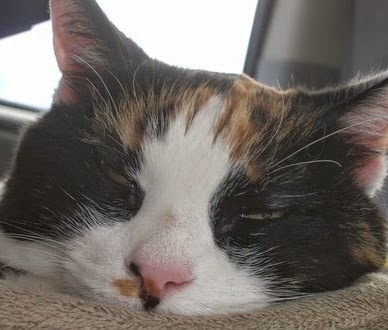 Her reasoning was that Rosie's hydration was still not great but had improved, and Rosie showed an especial dislike for having her skin tented when her hydration level was checked, and the vet did not want her to become unduly stressed by receiving fluids twice daily. Now, on the mirtazapine Rosie's appetite did increase a bit, although inconsistently so. She ate decently well last Friday morning before I dropped her off at the vet, but then after taking her back home she would not touch her food the rest of the day. I syringe fed her throughout the afternoon in hopes of combating further significant weight loss. She did a little better on Saturday, nibbling at her food throughout the day. That night, though, she started acting very uncomfortable and would not eat, drink, or hardly even move. She again urinated in my bed, and after then watching her struggle to rather uncomfortably defecate, I gave her some leftover buprenorphine (pain med) that I had received from the vet earlier last week. Within a couple hours of receiving the pain med she seemed far more content and alert. Sunday morning, then, Rosie started lapping at her food the second I put it in front of her. She drooled quite excessively as she was eating, making a royal mess of herself, but she was eating! She did that throughout the day, and even though her appetite was nowhere near what it used to be, I was so excited! The new issue, though, was that she also started a new habit of drinking water like there was no tomorrow, sometimes even lying with her head in the bowl and drinking for minutes at a time. She also started urinating more frequently. The volume of her urine remained normal, but she started urinating around five times a day rather than her usual two to three times.Also, her hind limbs started to appear especially weak. I started frantically going through the potential causes in my head -- had she developed diabetes from the pancreatitis? were her kidneys now acting up? was she developing liver disease? So, I called the vet's office Monday morning. Rosie's usual vet was not in, but I told the other vet that Rosie was eating decently well, but that she was drinking and urinating more than usual. I also told him that she was starting to look and feel more dehydrated. Since this particular vet had removed Rosie's eye but had not seen her since, he went through her recent records and then got back to me. He told me that he is concerned that her increased thirst and urination and her dehydration could be signs that her kidneys are starting to suffer. He advised me to begin giving Rosie fluids twice a day again, 150 ml's each time. He also gave me the okay to refill her cerenia and buprenorphine so as to continue her on those. Now, for today...This morning and through this afternoon Rosie suddenly did not want to eat on her own again. She also, however, has not really drank anything today. Throughout the day she acted alert, and I've convinced myself that she looks maybe a tad bit more hydrated since receiving a whopping 300 ml's of fluids both yesterday and today (600 ml's total in two days!). Yet, she won't eat. Occasionally today she has done a bit of smacking, especially when offered food or when attempting a bite of food. It seems her nausea has returned, therefore, even though she's still getting Cerenia. I guess that's why it was perfect timing when Rosie's usual vet called me earlier today to check in on her old gal of a patient. I told her of Rosie's lack of appetite. I did inform the vet that Rosie is due for a bowel movement, and when she needs to defecate she typically refuses to eat. So, the vet decided that we will give Rosie through the night to see if she defecates. Regardless, though, I scheduled to take Rosie in tomorrow at 4:30 pm for a recheck exam and bloodwork. They will check her glucose to rule out diabetes, check her renal values to see if that is what's causing her persistent signs of illness, and check her liver enzymes to see if she's okay in that area. I'm sure they'll also do a recheck pancreatic SNAP test to see if she's still fighting pancreatitis. Remember this, Rosie? See? Food's yummy. Eat it! I thank you all for your kind purrs and prayers through all of this, and I appreciate any more you can spare for my sweet old girl! Also, thank you for your patience with this worried sick momma. As I'm sure you can tell by now, I tend to cope with stress and worry by writing everything out and sharing my thoughts. If you've made it through all of my tomes of posts lately, I commend you.